Narrow, shady streets with Geranium covered balconies and green terraces of olive trees that shimmer under the Mediterranean sun. We travel across rolling hills that are idea for cycling and exploring a countryside dotted with white washed villages. This guided tour travels through three major cities of Spain; Seville, Cordoba and Granada. Their ancient cultures create a magical quality of life that beckons you to a slower rhythm and summons the gypsy in all of us. If you’ve never been to Spain, join us on this guided tour and discover the Treasures of Andalucia! Connected by plazas fragrant with sweet orange blossoms, we tour Seville’s Cathedral and the Jewish Quarter of Santa Cruz. Enjoy the dry sherry at our orientation gathering before dinner this evening. Tonight, after our Tapas dinner, fiery Flamenco will awaken your senses to the colors of Spain. Mudejar churches and winding cobbled stone streets. Today’s ride takes us through fields of poppies, wheat and rows and rows of sunflowers that take us to a walled city settled by the Romans. Ride through rich green farmland and past the grazing bulls to the ever- imposing castle of Almodovar. 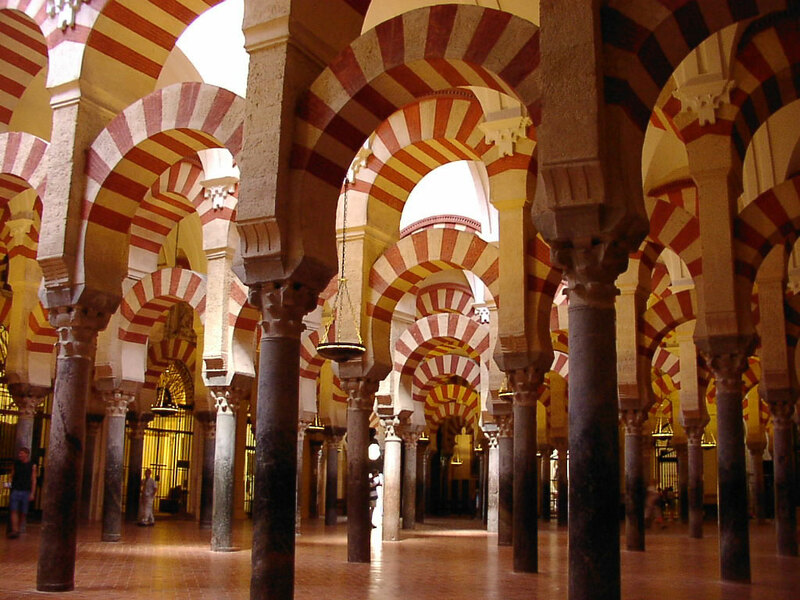 We’ll visit the intriguing 8th century Mezquita. Tonight, we dine on traditional time- honored recipes before we visit a “tablao” to listen to Spanish guitar players as they take us to another time and place with their music. Pueblos blancos, Almond orchards and olive groves give us our picturesque landscape as we bike through the Sierra Subbetica. This lovely gentle route takes us in and out of the fertile Genile River Valley to the birthplace of 19th century poet Federico Garcia Lorca. We’ll tour the breathtaking Alhambra with an art historian and this evening our farewell dinner in a 14th century mansion will offer stunning views of this enchanting city. Spend the next two days on the beach of this sunny, coastal, cosmopolitan city. Enjoy great shopping and beaches lined with “chiringuitos” which are wonderful little beach shack restaurants where you can enjoy great meals and cocktails all day into the early morning hours. Lounge on the Mediterranean, visit the Picasso museum, play Golf; the possibilities are endless.